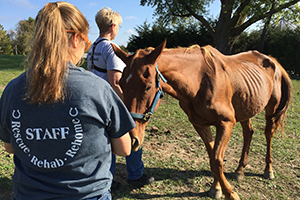 Yesterday, life changed for eight severely neglected equines. 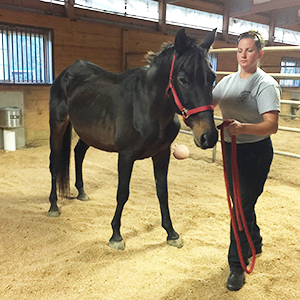 For several weeks, investigators from HSMO’s Animal Cruelty Task Force had been working with the owners of these equines to improve their living conditions. When the animals’ conditions continued to deteriorate, it became apparent the owners were unwilling to provide adequate care for their animals. The animals had no food. The only water available was filthy. Working with the Sullivan County Sheriff’s Office, a warrant was obtained to remove the five horses and three mules from the property. There’s no excuse for the prolonged neglect and abuse of these helpless animals. We will not allow these equines to slowly starve to death, and we are recommending prosecution to the fullest extent of the law. We will do everything possible to give these horses and mules the second chance they so desperately deserve. Your support helps the Animal Cruelty Task Force investigate, heal and prevent animal abuse throughout Missouri, and to be there when animals need to be rescued from the most dire situations. Rehabilitation of these severely neglected equines will take many months, and the costs add up quickly. Your generous gift will help rescued horses and mules heal. They deserve nutritious food and clean water. They deserve to be healthy, happy companions and given a second chance at a loving, forever home. Your donation to the Second Chances Equine Fund will enable Longmeadow to return these animals to health, and find them loving homes. Thank you for your care and concern about the welfare of horses and farm animals in our community. Provide a de-licing treatment to alleviate itching and hair loss. Give a rescued horse or mule a medicated bath for rain rot. Provide necessary vaccinations for a rescued equine. On behalf of the animals, THANK YOU!